The IRF Family came together in the beautiful city of Paris, at the historic location of Maison de la Chimie next to the Assemblée Nationale, to conduct its statutory meetings. During this meeting, the IRF Membership decided on the date and location of the 18th IRF World Meeting. IRF, together with the FIA, held a high-level seminar in Paris on Road Safety, Sustainable Development and Financing. Contributors to the seminar included, among others, the President and Secretary General of the FIA, the Secretary General of ITF, and the Chairman of iRAP. Fleet Forum and IRF have signed a three year agreement to collaborate on conducting fleet management training courses. The courses focus on improving road safety, cost effectiveness, and environmental performance of fleets by providing fleet managers with state-of-the-art tools and knowledge. IRF has strengthened and expanded the collaboration with the University of Birmingham. This expanded collaboration will cover, in addition to the annual Senior Road Executives Course (23 June-5 July), three new courses on: road safety, rural roads and road management. Our IRF Committees on ITS, Safety, Environment and Financing are gearing up for an exciting second part of the year with an ambitious work programme which will see new publications released and initiatives launched. You will be able to read more about these achievements and other on-going initiatives in this edition of the newsletter. We look forward to meeting you soon again. Check the new section “Where to find us” and see who you can meet when and where! IRF and the Fédération Internationale Automobile (FIA) jointly organized a seminar on Road Safety, Sustainable Development and Financing on Thursday 17 April, one week after the UN adopted its latest resolution on “Improving global road safety”. The seminar was hosted by FIA at their headquarters in Paris and brought together a distinguished panel of international speakers. The IRF held its annual Statutory Meetings in Paris on 16th April 2014. Besides reviewing activities and plan for the year to come, the gathering provided an opportunity to firm up the venue and dates of the next IRF World Meeting. This major event will be held at New Delhi, the capital of India on 14-17 November 2017. The Road Safety community met in New York on 10th April for the United Nations Road Safety Collaboration (UNRSC) group meeting and the debate in the UN General Assembly on a new Road Safety Resolution. The International Road Federation was represented by Susanna Zammataro who serves, within UNRSC, as co-chair of the project group dedicated to Safer Roads and Mobility. In conjunction with the IRF Statutory meetings, the IRF Policy Committee on Intelligent Transport Systems (ITS) met in Paris on Wednesday 16 April. The agenda of the meeting featured an update on current ITS deployment and policy issues in the host country, France. Released in Geneva on 11 December, in the framework of the IRF Summit “Bringing Policy and Practice Together”, the publication “Moving Towards Green Road Infrastructure: Case Studies and Lessons Learned” marked the fulfillment of the goal the IRF Environment Committee had set for itself in terms of tools to be developed to elucidate the stand of the Federation and its members, when it comes to roads and environment. The IRF Environment Committee now calls for new case studies to be added to the publication. The meeting of the IRF Group of Experts on Road Safety took place in Paris on 16 April in conjunction with the IRF Statutory Meetings and IRF-FIA Seminar Road Safety, Sustainable Development and Financing. The main objective of the meeting was to bring together members to review progress in implementing the 2014 Action Plan and discuss new initiatives for 2014. The IRF Statutory meetings in Paris on 16th of April provided the occasion for the IRF Road Financing & Economics Committee to hold its 6th working meeting. IRF Chairman Mr Kiran Kapila introduced Mr Joseph Haule, Roads Fund Manager from Tanzania, as the new committee chair. Mr Haule takes over the role from Mrs Vilrid Femoen, who has left the Norwegian Road Federation to join the Norwegian Public Roads Administration in April 2014. Organized by the International Transport Forum (ITF) at the OECD in Paris on 10-11 April 2014, the meeting aimed at debating a series of issues related to transport statistics and how to develop a more consistent and efficient international framework in this field, by promoting exchange between experts from different countries and organizations. IRF Geneva was represented by its statistics & data specialist, Cristian Gonzalez, who was invited to discuss the quality and coverage of inland transport statistics. Hosted in Melbourne, the Decade of Action Policy & Donor Forum 2014, provided an excellent opportunity to celebrate the anniversary of the launch of the Decade of Action for Road Safety and to assess progress. IRF Chairman, Mr Kiran K. Kapila was invited to address this distinguished audience of Road Safety champions. Only 28 weeks to go before the 12th edition of the Michelin Challenge Bibendum! Join the IRF today! 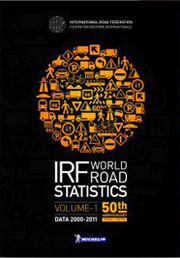 Take advantage of a whole range of services including special rates for the IRF World Road Statistics (2013), other IRF publications and preferential registration rates for upcoming IRF events!